I am proud to announce that I have begun showing my paintings with Thomas Hayes Gallery, 6162 Santa Monica Boulevard, in Hollywood, California. This Friday is the gallery’s grand opening. It is a wonderful honor to be a part of the gallery’s launch. More specifics about the gallery and grand opening are here on Dwell.com. 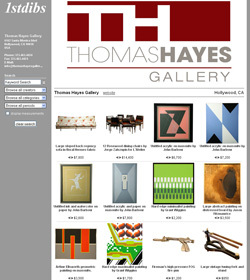 Likewise, Thomas Hayes Gallery has begun to offer my work through the venerable modern lifestyle site 1stdibs.com. You’ll find a few of my works at thomashayesgallery.1stdibs.com. Click to see my paintings on Thomas Hayes Gallery’s 1stdibs.com storefront. Thomas Hayes, who co-founded the legendary NOHO Modern furniture gallery, invited me to show at his new gallery as I was preparing for my current Scottsdale contemporary art show, Circles with Corners, which is on view through May 15 at Soyal Gallery. Over the ensuing few weeks, Hayes and I have had many productive discussions. Clearly, he’s very passionate about what he does, and I believe he’s absolutely the right person to bring my work to the West Coast audience. Hayes is a connoisseur of hard-edge painting. At NOHO Modern in 2003, he staged an important show for hard-edge painter June Harwood. He also currently represents work by John Barbour. Harwood and Barbour both showed in the storied California Hard-Edge Painting exhibition, organized by Jules Langsner, in 1964. To be certain, I am humbled to be hanging my work in the same space as Barbour. While Hayes is fond of my minimal, hard-edge paintings, he also appreciates my maximal works. Therefore, in the Dwell.com write-up, my work is described as “hard-edge minimalist/maximalist paintings.” It’s very cool to know that my two approaches to painting are able to coexist at Thomas Hayes Gallery. Having a chance to show in Los Angeles, at a gallery of this stature, is a dream fulfilled. It’s that simple. I’m looking forward to seeing how things progress. This entry was posted on Tuesday, April 6th, 2010 at 3:43 pm. You can follow any responses to this entry through the RSS 2.0 feed. You can leave a response, or trackback from your own site.